Although Mr. Arnesby Brown divides the greater part of his time between Cornwall and the Norfolk Broads, he may be said to belong to the St. Ives School of painters, of whom he is the most prominent. His delightful pictures are very popular, and examples of his art grace many of the public galleries. He was born In Nottingham in 1866, and attended the School of Art there before becoming a private pupil of the late Andrew MacCallum, under whom he learnt the importance of accurate observation and of correct painting. At that time he worked much in the open air, and the influence of his studies is found in his out-door paintings to-day. He joined the Herkomer School at Bushey in 1889, and remained there three years, during which his first Royal Academy picture, " A Cornish Pasture" (exhibited in 1890), was painted while he was on a visit to the "delectable Duchy." Ever since his first picture was shown he has been an annual exhibitor at Burlington House. " The River Bank" was painted in Norfolk, and appeared in the Royal Academy in 1902, the year before he was elected an A.R.A. It followed the " Morning," now in the Chantrey Collection, The picture is painted in rich, glowing colours, which, with the effect of atmosphere, invest the simple subject with the dignity of nature itself. Some cattle are grazing by the riverside on a showery day. The skins of the animals glow in the sunshine which irradiates the misty air. On the right of the picture part of a rainbow's arc is seen, stretching up into the sky, from which the clouds are breaking away in green and purple glories. It is a beautiful picture, full of the majesty and peace of nature in a wilful mood. 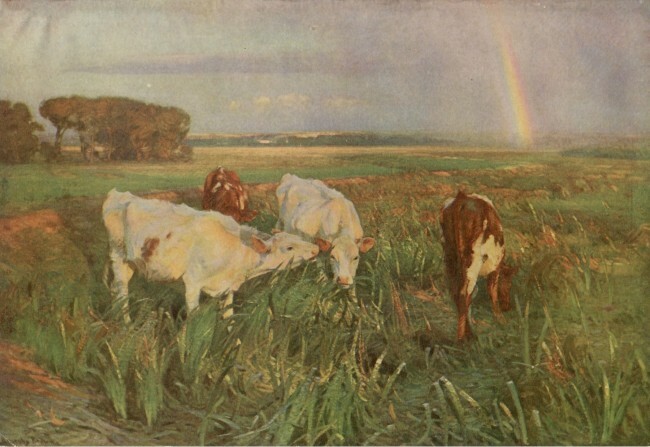 "Cows Grazing on a Marsh"